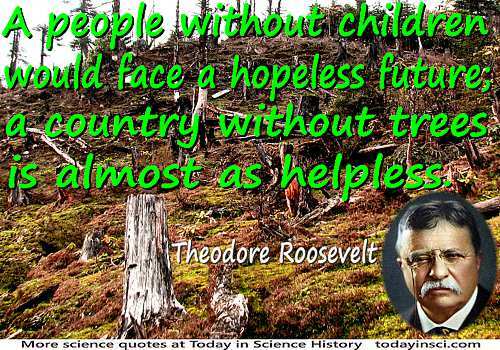 A people without children would face a hopeless future; a country without trees is almost as helpless. Letter to the School Children of the United States, Arbor Day (15 Apr 1907), in Presidential Addresses and State Papers (1910), Vol. 6, 1208. Conservation and rural-life policies are really two sides of the same policy; and down at the bottom this policy rests upon the fundamental law that neither man nor nation can prosper unless, in dealing with the present, thought is steadily given for the future. 'Rural Life' (originally published in The Outlook, 27 Aug 1910). In The Works of Theodore Roosevelt. Vol. 16: American Problems (1926), 146. The Homiletic Review, Vol. 83-84 (1922), Vol. 84, 380. More and more, as it becomes necessary to preserve the game, let us hope that the camera will largely supplant the rifle. Introduction to Allen Grant Wallihan, Camera Shots at Big Game (1901), 11. The ages have been at work on it and man can only mar it. 'Our National Inland Waterways Policy', Address to the Deep Waterway Convention, Memphis, Tennessee, 4 Oct 1907. In American Waterways (1908), 9. There are no words that can tell the hidden spirit of the wilderness, that can reveal its mystery, its melancholy, and its charm. This country will not be a permanently good place for any of us to live in unless we make it a reasonably good place for all of us to live in. Speech at the Auditorium, Chicago, Illinois, 17 Jun 1912. In Social Justice and Popular Rule reprinted in Politics and People (1974), 316-317. [Among the books he chooses, a statesman] ought to read interesting books on history and government, and books of science and philosophy; and really good books on these subjects are as enthralling as any fiction ever written in prose or verse. 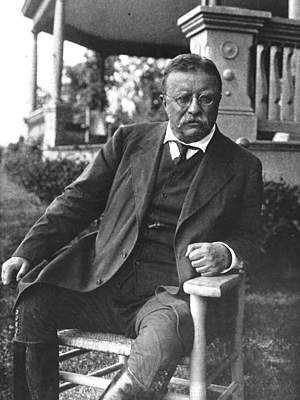 In Theodore Roosevelt: An Autobiography (1913), 333. This isn’t just about today, this about generations to come. 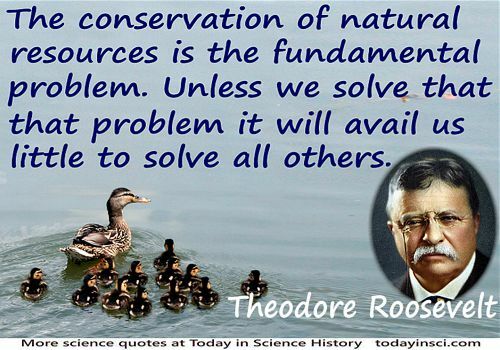 And you’ve got a chance to be the greatest conservation President since Theodore Roosevelt, and I think he’s done it. From transcript, 'Exit Interview: Bruce Babbit', PBS Newshour (5 Jan 2001). On pbs.org website.